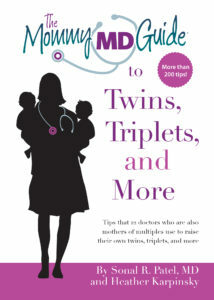 The Mommy MD Guide to Twins, Triplets, and More is filled with more than 200 tips that 12 doctors who are also mothers of multiples use for their own families. It offers wit and wisdom on pregnancy and birth, feeding, diapering and dressing, sleeping, going to work and school, coping with health problems, traveling, and fostering multiples’ unique personalities. MomMy Time sidebars suggest ways for moms to relax, de-stress and love life! The Mommy MD Guide to Twins, Triplets, and More is the seventh book in the popular Mommy MD Guides series. Welcome to the Mommy MD Guides! Buy it here, on amazon.com, and in bookstores! Coming soon, buy the audiobook!